In the mid-1970s, Yolanda Fernández de Cofiño began working with her husband operating McDonald's restaurants in Guatemala. She created what she called the "Menu Ronald" (Ronald menu), which offered a hamburger, small fries and a small sundae to help mothers feed their children more effectively while at McDonald's restaurants. The concept was eventually brought to the attention of McDonald's management in Chicago. 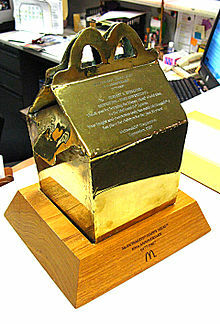 The company gave the development of the product to Bob Bernstein, who then came up with the Happy Meal. Often, the Happy Meal is themed to promote a current family-oriented movie. The first such promotion was the Star Trek Meal, to promote Star Trek: The Motion Picture in December 1979. The packaging used for the Star Trek Meal consisted of various images and games related to the film, as well as a comic-strip adaptation of the film. Consumers had to buy numerous meals in order to complete the set. In 1982, McDonald's recalled Happy Meal toys because they could have been dangerous to children under 3 years of age. In 1992, McDonald's withdrew their range of Happy Meal toys for the film Batman Returns, after complaints from parents that the film was unsuitable for children. In July 2011, McDonald's announced plans to make Happy Meals healthier, including the addition of apples. The redesigned meals will contain a smaller portion (1.1 ounces) of fries, along with the apples. On February 4, 2013, McDonald's announced that Fish McBites, fried Alaskan pollock, the same fish used in Filet-O-Fish, would be added as an entree, which would run until March, intended to coincide with Lent. In 2014, McDonald's added a mascot to Happy Meals in the United States, known as Happy. Happy was originated from France in 2009. Reactions were mixed, with criticism that the mascot's design was too frightening. 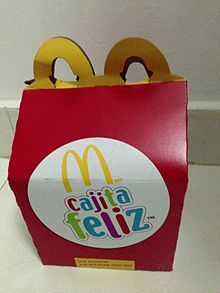 The Happy Meal did not introduce the practice of providing small toys to children. When the Happy Meal started in 1979, the toys back then were a McDoodle stencil, a McWrist wallet, an ID bracelet, a puzzle lock, a spinning top, or a McDonaldland character-shaped eraser. In Canada, the promotion prior to the Happy Meal was called the "Treat of the Week", where a different toy was available free on request each week. This promotion continued after the Happy Meal was introduced in 1979. Happy Meal toys have become increasingly elaborate in recent years. While initially they were little more than a cheap plastic trinket such as a Frisbee or ball, they have gradually been replaced with increasingly sophisticated toys, many of which are a tie-in to an existing TV show, film, or toy line. On November 2, 2010, the San Francisco Board of Supervisors passed a law requiring that children's meals sold in restaurants must meet certain nutritional standards before they could be sold with toys, to reduce triggering of childhood obesity. The law, urged in part by an increase of childhood obesity in the United States, would allow toys to be included with children's meals that have less than 600 calories and less than 640 milligrams of sodium, contain fruits and vegetables, and include beverages without excessive fat or sugar. The board overturned the veto of Mayor Gavin Newsom on November 23 to pass the law. The law has been ridiculed by the satirical news program The Daily Show. McDonald's circumvented the ban by charging 10 cents for the toys. A class action lawsuit seeking to ban Happy Meal toys in California was filed in 2010. The suit was dismissed in April 2012. In Chile, the Happy Meal, along with kids' meals at other fast food chains, will no longer include free toys, in response to a law banning such toys in a move to curb obesity. ^ "Sliced apples sold to McDonald's, Burger King and grocery chains recalled for Listeria". CBS News. August 13, 2012. ^ "La señora del Mac menú". El Periodico. 1 August 2006. Archived from the original on 3 February 2014. ^ Pellicer, Lilliana. "Señora Presidenta". Prensa Libre. Archived from the original on 19 March 2012. Retrieved 27 July 2011. ^ "Creator of the Happy Meal Says KC Makes Him Happy". NBC Action News. Retrieved 18 August 2011. ^ Applegate, Jane W. (October 23, 1988). "Food for Tots". Los Angeles Times. p. 1. ^ "Prizes Recalled By McDonald's". The Washington Post. November 3, 1982. p. A1, B1. ^ Choi, Candice (2013-02-04). "McDonald's to put 'Fish McBites' in Happy Meals". Yahoo! News. Retrieved 2013-02-04. ^ Tuttle, Brad (23 May 2014). "Why McDonald's Is Loving the Creepy New Mascot Everybody's Bashing". time.com. Retrieved 28 July 2017. ^ Staff. "25 of the Coolest McDonalds Happy Meal Toys from the 1980s - TechEBlog". Retrieved December 10, 2016. ^ "San Francisco Overrides Mayoral Veto, Bans Happy Meals with Toys". CNN. November 23, 2010. Retrieved December 15, 2010. ^ "San Francisco's Happy Meal Ban". The Daily Show with Jon Stewart. January 3, 2011. ^ "McDonald's finds a way around San Francisco's 'Happy Meal ban'". NBC News. November 30, 2011. ^ "McDonald's Can Keep Happy Meal Toys, Court Rules". ABC News. 2012-04-06. Retrieved 2012-06-12. ^ Cuen, David (4 August 2012). "Chile bans toys in children's meals to try to fight obesity". BBC. Retrieved 28 August 2017.